the date of celebration is over but i don't think it is late for me to talk about it and celebrating it because for me we have to celebrates the day everyday as appreciation to the most adorable woman in the world...Mother. without her, of course no one from us will be here. will be what we are now. Since I was a kid, I am always jealous towards my friends who always telling me the story of her mother. but me?? I dont have that kind of story to share with friends because the most important woman in my life is no longer with me either in this world. She left us when I am 3 years old.In that age, there are so little of memory with her that I can remember, only the photo of her that remind me. Because of that, I think it is only me and people who in the same condition with me will know how life would be without Mother. Especially when your mother left when you are still small, still need her love and still need her guidance. actually, we will need all of that for whole of our life.Right?? But, ayah always tell me that I am lucky. Even I have no mother besides me, I have uncles, aunties and cousins who's really close to me and love me until I never have feeling of emptiness without my Mother(but of course I do remember her!). One of them is my aunty whom called Aunty Milah. She is so idolized as a woman because she is not only good mother for her sons, but also a good mother for me. She is kind of perfect woman that I've ever met. I am not saying this because she is my aunty but this is really true. I had witnesses her difficulties to earn money for life and education of her sons until all of my cousins succeed in their life. In the difficulties, she also spent her time to visit my grandmother(who was staying with me that time), and to help her brothers(my uncles and ayah) in any issues. With all the big responsible, she is still a loyal wife to her husband and she did her job very well without complaining. I adore her spirit. she is so tough with all the responsibilities and difficulties in her life. she face it with patient. always hope and pray that i will have the same spirit as her. 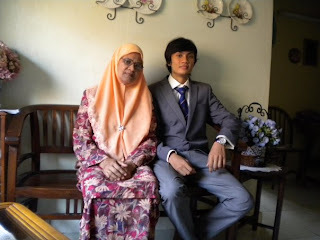 Of course, Ibu will always be a queen of my heart because she is the one who brought me into this world but my aunty is a great woman in my heart and an idol for me because she is the one who take care of me and my family until now. Aunty Milah with my cousin.